What’s Inside Qin Shi Huang’s Tomb? Archaeologists are currently excavating further areas of the mausoleum of Qin Shi Huang, the first and most infamous Emporer of China. The site, where the magnificent terracotta warriors were discovered relatively recently – 1974 – contains the undisturbed tomb of the Emperor. With rumours of flowing mercury and incomparable treasures, the question on everyone’s lips is – what’s inside? Qin Shi Huang, the First Emperor of the 3rd century BC Qin Dynasty, ruled the largest unified kingdom the Far East had ever witnessed to that date – the very basis of Imperial China. In military power, economic strength and technical innovation, the Qin – with their strongly centralised system of government – were all powerful. Shi Huang was the totemic and ruthless totalitarian ruler that held the entire kingdom together. Indeed, the empire crumbled in just a few short years after his passing in 221 BC. Possessing a grossly swollen ego to match his achievements and status, Shi Huang ordered the construction of a staggeringly large and ornate tomb for himself outside the Qin capital of Xi’an, one that is said to have required hundreds of thousands of labourers to build. Work began when Shi Huang was just 13 years old, so sure was he of his impending glory. The tomb attracts many thousands of tourists every year, but has not yet been explored – and perhaps may never be. If legend about what’s inside is true – and, incredibly, all evidence to date suggests it is – then the First Emperor’s mausoleum contains a wealth of treasures and adornments perhaps greater than any other in ancient history. 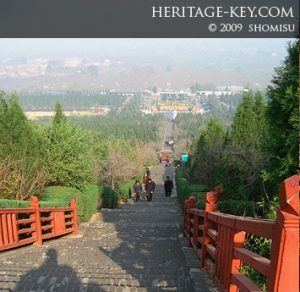 The Eye of the DragonQin Shi Huang’s tomb can be found 35 kilometres east of Xi’an, between the Lishan Mountains in the south and the Wei river in the north. Traditional Chinese geomancy has it that the area between the Lishan Mountains and Mount Hua is shaped like a dragon. The imperial tomb, inside Li Mountain, is said to be positioned at the eye of the dragon. The mountain itself, which is covered in trees and vegetation, is roughly as big as the Great Pyramid of Giza, and covers an area of about one square mile. It was once perhaps twice as big, but it’s been worn down by 2,000 years of erosion to its current dimensions. But that’s beside the point, because to judge the scale of the First Emperor’s Tomb simply on the basis of the mountain he’s buried within would be misleading. Qin Shi Huang firmly believed that he was to live on in the afterlife, so he wanted to ensure he had a powerful setup there, one befitting his standing. He had entire area many kilometres wide surrounding Li Mountain transformed into an overground and underground city, protected by his own personal honour guard, the stunning Terracotta Warriors. The Terracotta Warriors are arguably the most spectacular archaeological find of the 21st century – a life-sized horde of unique, individually carved soldiers chariots, horses, officials, acrobats, strongmen and musicians, all stood neatly in rank and file and estimated to number as many as 8,000. They were discovered in 1974 by local farmers drilling a water well, and have been partly excavated at three different spots. Many have been damaged or looted, and all have lost their original vivid, lifelike colour, since their painted surfaces have faded over the centuries. But as an indication of the sheer scale and ingenuity of the work put into the First Emperor’s necropolis complex, they’re simply breathtaking. On the one occasion which a handful of the statues traveled abroad – for a special exhibition in London in 2007-2008 – the British Museum recorded its most successful year ever, exceeding even the famous Tutankhamun exhibition of 1972 for visitors. Since the Terracotta Warriors’ discovery, archaeologists have been investigating the ground between their location and the Emperor’s tomb itself, and have uncovered a network of 180 different sites, containing everything from miniature offices, towers and walls with gates to gardens, lakes, animals, entertainers and ornaments. Qin Shi Huang – who is said to have slowly been driven insane by the weird chemicals he drank in search of an elixir of life to ensure his immortality – evidently attempted to have an entire replica world constructed for himself, all of which was connected to his tomb. Artisans apparently carved a map of the entire Qin kingdom on the floor, laced the ceiling with jewels to represent to sky, and created rivers and oceans with quicksilver. Rivers of Quicksilver?The best available source on the contents of Qin Shi Huang’s final resting place itself is the Shiji, or Records of the Grand Historian, by Sima Qian – a Prefect of the Grand Scribes of the Han Dynasty. It was composed a century after the First Emperor’s death. It reads like a work of extreme fantasy. 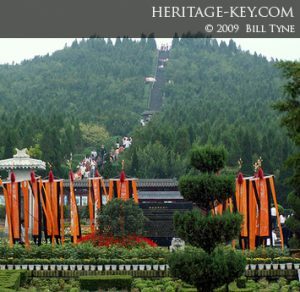 Sima Qian reports that 700,000 workers were employed to burrow through three rivers, and fill the space with bronze. Then artisans apparently carved a map of the entire Qin kingdom on the floor, laced the ceiling with jewels to represent to sky, and created rivers and oceans with quicksilver – that is, liquid mercury (which was widely believed to have life-preserving powers in Qin times). A special machine was even apparently conceived to keep the mercury rivers flowing. Qin Shi Huang had immense power and resources at his command, but enough to build a tomb such as this? The quantity of mercury ore that would have been required alone would have amounted to tens of thousands of tons. Since the First Emperor’s tomb has never been opened, we can never know for certain the truth of Sima Qian’s words. But thanks to some ingenious modern techniques employed by archaeologists, we can hazard a pretty accurate guess. Tomb Raiding, 21st Century-StyleWritings on Qin Shi Huang’s tomb contain ominous tales of intricate networks of booby traps, poised to maim and kill any who might try to enter. But there’s a more pressing reason for archaeologists being reluctant to crack open the First Emperor’s tomb and clamber inside – they simply don’t have the technology to preserve its delicate contents yet, so at least until they do it will remain sealed. Even then, some argue that its mysteries are best left alone, lest they end up irreparably damaged like many of the artefacts found in King Tut’s tomb. Yet, there was another way in. A research team under Chinese archaeologist Duan Chingbo in 2005 used a combination of ground-penetrating radar, electrical resistance measurements and core samples – all gathered from outside – to build up a CGI picture of the mound’s interior. It showed a large pyramid shape carved inside, and within it a hermetically sealed space the size of a football pitch that can only be the location of the First Emperor’s tomb. In a bid to corroborate Sima Qian’s story of the rivers of mercury, each of the 4,000 core samples taken from the mound were analysed for traces of mercury vapour, which would have presumably seeped through the packed earth above over the course of the last 20 centuries. Staggeringly, all of the samples came back highly positive, particularly those taken from the area of the burial chamber itself. All evidence would suggest that there really are rivers of quicksilver flowing around Qin Shi Huang’s lifeless body, presumably within a football pitch-sized map of his empire. Despite the apparent proof that the First Emperor’s tomb contains sights and treasures every bit as spectacular as rumoured, there’s perhaps one other, even more important reason why his burial mound should remain sealed forever. You might wonder why, if so many hundreds of thousands of workers were involved with the building of Qin Shi Huang’s mausoleum, there aren’t more stories echoing through history as to its interior and contents. The answer is quite shocking, and reflects the cruel brutality that was as much a part of Qin Shi Huang’s reign as was indulgent splendour. To preserve secrecy, the Emperor is said to have had each of the workers executed, in many cases by imprisoning them within the earthen mound. Perhaps it’s the memory of these fateful builders and artisans, more so than that of the wildly egotistical tyrant who quite literally sealed their fate, that deserve to be allowed to rest in peace?